When Five Horse Johnson formed back in 1995, referring to themselves as a “blues band,” a few brows might well have been furrowed. But this is a band that has always understood that the blues isn’t a formula – it’s a way of looking at the world. Their take on the blooze is as a dirty, sensual thing, enhanced with a healthy dose of humor. Now some two decades and seven albums into their career – with eighth Jake Leg Boogie, set to drop in Summer 2017 on Small Stone – Five Horse Johnson have dug out a niche of their own, a genuine love and respect for traditional blues and classic rock leading them to likewise become one of the most loved and respected bands in the heavy rock underground. Always a freight train live, they’ve toured the US (with Clutch and Halfway to Gone) and Europe extensively (including the festival circuit), gathering fans, friends, and drinking partners all over the Western World. 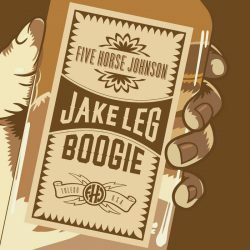 Jake Leg Boogie sees FHJ going back to its recording roots. Original drummer Tim Gahagan has rejoined, and the results are powerful. Brad Coffin’s guitar has never sounded heavier, his voice never stronger. Eric Oblander’s harp, meanwhile, is as sharp as a tailfin, and his gravelly vocal delivery a growling, howlin’ counterpoint to Coffin’s gruff style. Steve Smith’s bass is a strong backbone, while Phil Dürr’s guitar complements that of Coffin, adding extra edge for good measure. Jake Leg Boogie was recorded at Rustbelt Studios, with longtime producer Al Sutton (Big Chief, Novadriver, Halfway to Gone, Detroit Cobras) at the production helm, with a definitive nod to Dave Cobb (All Them Witches, Rival Sons). Artwork provided by noted graphic artist and FHJ-collaborator Mark Dancey, kyou to say thank you and ask for another. Which you will. Recorded by Al Sutton & Steve Lehane @ Rustbelt Studios / Royal Oak, MI. Produced by Al Sutton, Scott Hamilton. Mastered by Chris Goosman @ Baseline Audio Labs / Ann Arbor, MI. Fine Arts by Mark Dancey. Textiles by Vince Williams @ Creative Print / Warren, MI. All songs by FIve Horse Johnson. Thanks to all who have helped the cause.